Set up a network for easier system control and monitoring. Were all familiar with computer networks. They let a group of computer users share files, share a common printer or share common disk drives. Networks also are used for audio systems. Why would you want to network your audio components? Audio networks allow convenient control and monitoring of power amps and digital signal processing, and rapid transfer of audio and firmware files between components. In many concert sound systems, the power amps are incaccessible from FOH because they are placed on stage to shorten speaker cables and reduce power loss. Also, in many setups the suspended loudspeakers are inaccessible during a performance. Wed like to monitor and control those amps and speakers from FOH. Networking lets us do that. Upgrade component firmware. Download the firmware on your computer, then transfer it to a component via Ethernet. Control and monitor a remote audio system via the Internet. Following are some questions and answers about audio networks. What's the difference between a network, LAN and Ethernet? "Network" is the generic term for a data-sharing group of components. LAN or Local Area Network is a network within a venue. Ethernet is a popular standard of communication on a network. An RJ-45 Ethernet connector is on the back of most computer network cards. The data rate of regular Ethernet is 10Mb/sec. Fast Ethernet (also called 100Base-T) runs at 100Mb/sec and is recommended for audio work. CobraNet is another network protocol. A licensed technology developed by Peak Audio, CobraNet transfers data and digital audio on a single cable over a Fast Ethernet network. Some audio manufacturers have their own proprietary networks. For example, Crowns network is called TCP/IQ, which is designed to work with Crown IQwic software and IQ-compatible cards, DSP and amplifiers. Define some terms associated with networking. Network: A group of interconnected components that share data, such as a central computer, network switching equipment, and other computers or devices. Subnet: A small network within a larger network. For example, an audio network might be a subnet of a venues network, which could include computers throughout the building. Or an audio network might be divided into subnets. For instance, you might set up one audio subnet for the house system and another for the paging system. IP address: An identifier for a computer or device on a TCP/IP network. Each device in a network has its own IP address to identify it. Example: 126.126.17.42. Networks using the TCP/IP protocol route messages based on the IP address of the destination. What do I need to set up a network? In addition to your computer and audio components that contain Ethernet or CobraNet cards, you need Cat-5 cable and at least one network switch. Let's explain. Suppose you have one FOH computer and several power amps that you want to network. The computer has a network interface card (NIC) installed in a user slot. On that card is one or two Ethernet ports. You need a way to "Y" or "mult" the computer's Ethernet data to several destinations. A device for this purpose is called a network switch. This central device sends messages from the computer to all the devices in the network. It routes the computer's Ethernet data to the appropriate component based on the component's IP address. Each message is switched through the network to get to the final destination. Network switches are available from places such as Office Depot, Amazon, Best Buy and CompUSA. Some switch vendors are Linksys, Netgear, HP, Cisco and 3Com. How about cabling? Since computer data is an ultrasonic signal, you need special Cat-5 cable to prevent signal loss in a network. Short for Category 5, Cat-5 cable consists of four twisted pairs of copper wire terminated by RJ-45 connectors. The cable's impedance is 100 ohms and the capacitance is about 12-15 pF per foot. Networks can also be wireless. The maximum useable length of a Fast Ethernet cable is 100 meters over Category-5 copper cable, and 2 kilometers over multimode fiber. Proprietary Fast Ethernet, via single-mode fiber, can reach even further. CobraNet has the same distance limitation as Fast Ethernet. How does the network connect together? Basically you set up a star network (Fig. 1). Connect the Ethernet port on the computer to the switch, and connect the switchs Ethernet ports to the audio components. At each power amp is a network card plugged into (or built into) the back of the amp. Connect each Ethernet port on the network switch to each amp's Ethernet port. Do not daisy-chain or connect them in a serial fashion. Figure 1. Example of a star network. In this star arrangement, all components connect to a central switch. Each message is sent from the PC to the switch, then to the destination device. Once the network is connected, you assign an IP address to each component using networking software supplied by the power amp manufacturer. Ethernet data is transferred in data packets that have addresses coded into the data. The switch examines each packets address, then sends that packet only to the addressed component. This results in a much more efficient data flow than sending it to all components at once, as a network hub does. Currently almost all devices used are switches because they cost only slightly more than hubs. 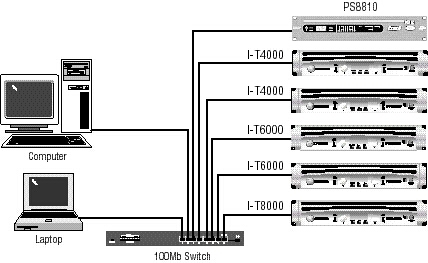 Switches come in different speeds.10Base-T is slow (10Mb/sec) and 100Base-T is fast (100Mb/sec). 100Base-T switches are recommended for audio work, and are required in CobraNet networks. Can I connect to more than one network? Yes. Youll need a router. Any data that is to go to the other network is routed through the IP Router. CobraNet data is held behind but IP data (typically control data) goes through. Some switches have routers built in. How do I assign TCP/IP addresses? An IP address is made of four numbers separated by periods. Each number can be zero to 255. The last number can never be a zero or 255. For example, 126.126.17.1 could be an IP address. 126.126.17.0 would not be a valid IP address. A TCP/IP or IP address has two parts: the NETWORK ID and the HOST ID. The NETWORK ID identifies the network, and the HOST ID identifies either the subnet and device, or just the device if there is no subnet. The subnet mask is a code that indicates which part of the TCP/IP address is the NETWORK ID and which part is the HOST ID. In subnet-mask code, 255 means This part of the address is the NETWORK ID. Suppose the IP ADDRESS of a device is 126.126.17.42 and the SUBNET MASK is 255.255.0.0. That means, (126.126) is the NETWORK ID. The remaining set of numbers (17.42) is the HOST ID. If your audio network stands alone (i.e., it is not part of a larger network) then the HOST ID identifies each device in the network. If your audio network is part of a venues larger network, your network is actually a sub-network or subnet. In this case, the HOST ID can be further divided into two or more parts. The first part is the SUBNET ID. The other part is the DEVICE ID. The first part of the HOST ID identifies the subnet of your audio system, and the remaining part identifies the particular device within that subnet. NETWORK ID - SUBNET ID - DEVICE ID. All devices in the network have the same network ID. All devices in a subnet have the same subnet ID. All devices, whether in a subnet or not, must have a unique device ID. DHCP (Dynamic Host Configuration Protocol) is a method for automatically assigning IP addresses to devices on a network. With dynamic (DHCP) addressing, a device might have a different IP address every time it connects to the network. If a computer is NOT connected to a network with a DHCP server, the computer will place a default network ID into the TCP/IP address and Subnet Masks. Be sure to follow the addressing rules given by the network software manufacturer. Otherwise, the computer may not communicate with the devices. 1. Turn off DHCP (automatic addressing). 2. Assign each device a static (fixed) IP address. 3. Make sure that the computer and all the devices have the same NETWORK IDs in their addresses. This tells the computer that all those devices are on the same network. 4. Make sure that each component has its own TCP/IP address, and there are no duplicate addresses. 5. Assign a subnet mask. Make it the same for all devices on the network. If the network you are assembling will interconnect with other networks, your network is considered to be a subnet within the larger network. Check with the network administrator to determine the proper Subnet Mask for your subnet. If you have a stand-alone network, set the Subnet Mask to 255.255.0.0 for all components, including the computer. Theres a lot more to know about audio networking. Details are available from www.iqaudiosystems.com and www.webopedia.com.